The speaker condemned the “anti-Semitic myth of dual loyalty” and told the AIPAC audience on Tuesday morning, “we must also be vigilant against bigoted or dangerous ideologies masquerading as policy, and that includes BDS,” referring to the Boycott, Divestment and Sanctions movement. 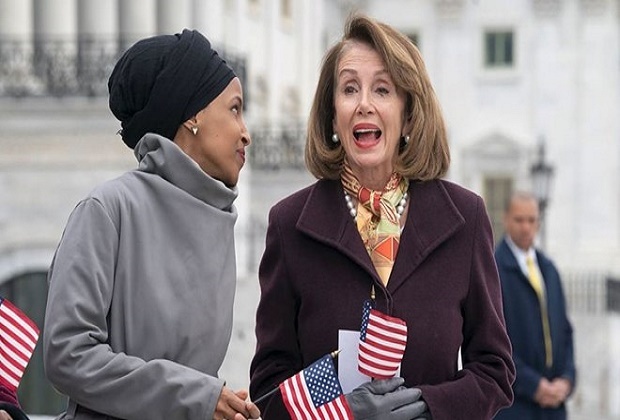 “A condemnation for people that want to exercise their First Amendment rights is beneath any leader, and I hope that we find a better use of language when we are trying to speak as members of Congress that are sworn to protect the Constitution,” Minnesota’s Omar told reporters in a Capitol hallway Tuesday – according to The Hill. “I want to ask, ‘Why is it OK for me to talk about the influence of the NRA, or fossil fuel industries or Big Pharma, and not talk about a powerful lobbying group that is influencing policy?’” she added. Israeli Prime Minister Benjamin Netanyahu, speaking after Pelosi, told the AIPAC conference, in a speech transmitted via satellite and marred with technical glitches: “Take it from this Benjamin, it’s not about the Benjamins,” referring to Rep. Ilhan Omar’s controversial tweet slamming the pro-Israel lobby.